The Ardi fossil was painstakingly recovered over a number of years after November 1994 following on from an initial discovery of teeth and small bones from what appeared to be a hominid species that had been made in 1992. 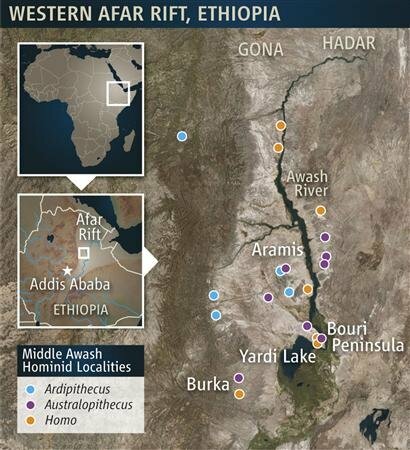 The initial discovery and subsequent scientific recovery being made in Ethiopia's Afar Rift, where erosion had exposed 4.4 million-year-old clay sediment, in what had been an ancient river valley but was now a semi-arid desert region lying to the north and east of Addis Ababa, the Ethiopian capital. This is not the first time that a celebrated fossil of an early hominid species had been discovered in Ethiopia as the very important Lucy fossil, of an individual from a species known to science as Australopithecus afarensis and dating from some 3.2 million years ago, was unearthed in 1974 only 74 kilometres from where the fossil remains of Ardi were found. This means that, in terms of inquiry into the course of possible human evolution / the origins of our species, the Ardi fossil has displaced Lucy as being from the earliest "reliably known about" possible close human ancestor species. According to Todd Disotell, an anthropologist at New York University's Center for the Study of Human Origins. "This is as important as Lucy...we have a much better picture, which allows us to improve upon our estimate of the last common ancestor...Ardi brings us to within 1.6 million years of the last common ancestor." Similarly David Pilbeam, curator of paleoanthropology at Harvard's Peabody Museum of Archaeology and Ethnology, has said:-. "This is one of the most important discoveries for the study of human evolution...It is relatively complete in that it preserves head, hands, feet and some critical parts in between. It represents a genus plausibly ancestral to Australopithecus" and begins "to fill in the temporal and structural 'space' between the apelike common ancestor and Australopithecus - itself ancestral to our genus Homo." Ardipithecus is seen as having had a mix of "primitive" traits, shared with its predecessors, and "derived" traits, which it shares exclusively with later hominids. One of the authors of one of the scientific papers appearing in Science magazine has stated that the Ardi fossil is "so rife with anatomical surprises, that no one could have imagined it without direct fossil evidence". The problem was that these pieces had been very broken at the time that they were deposited. They were in very bad shape. They were at that point in time cemented into a very hard silky matrix so those had to be removed from the field, encased in plaster jackets and hardened with a consolidant. Very, very fragile. It took us many, many years to clean the bones in the National Museum of Ethiopia and then set about to restore this skeleton to its original dimensions and form; and then study it and compare it with all the other fossils that are known from Africa and elsewhere, as well as with the modern age. This is not an ordinary fossil. "Darwin said we have to be really careful. The only way we're really going to know what this last common ancestor looked like is to go and find it. Well, we have not found it. But we have come closer than we have ever come...And, just like Darwin appreciated, evolution of the ape lineages and the human lineage has been going on independently since the time those lines split, since that last common ancestor we shared." The text on the following image is intended to allow many of our visitors to, very conveniently, glance across from explanatory text to the picture of Ardi's skeleton. The face had a projecting muzzle, giving her an ape-like appearance. The details of the bottom of the skull, where nerves and blood vessels enter the brain, indicate that Ardi's brain was positioned in a way similar to modern humans. Ardi's face and her brain were also relatively small at about the size of those of a modern female chimpanzee. The skull features smallish, relatively human-like teeth. Her tooth types, the associated tooth enamel thickness, and certain isotope residues all point to a somwhat varied, rather than a strictly fruit-eating diet. The absence of long canine teeth, which could have been used for threat or fight, could indicate that Ardipithecus, all of 4.4 million years ago, had adapted in-group social behaviours in which threat-displays were not reliant on canine teeth. The fossil set shows that males were close in size to females again possibly suggesting something about the dynamics of Ardipithecus' group life and pairing behaviours. Ardi had a mobile lower back with more vertebrae than the stiff backs of arboreal African apes. Pelvis : The pelvis and hip show the gluteal muscles were positioned so she could walk upright whilst also being a capable climber of trees. The hipbone includes structures unique to hominids like us, but not found in modern apes. Ardi's hands feature a large and well-muscled opposable thumb. Her wrists were flexible like ours, not stiff like those of chimpanzees and gorillas, which often support their heavy upper bodies whilst 'walking' on their knuckles. Ardi lacked the powerful upper torso and stiff wrists needed to swing from branch to branch as easily as modern apes but could easily cling to trees with her hands and feet suggesting that Ardipithecus had to be a careful climber and walked or rested on top of branches placing weight as necessary on the palms of its hands. Ardi had an opposable large toe, which was kept in alignment by a little bone, but which could have been useful for gripping branches. She also had a relatively stiff outer foot, more like ours than an ape's. This rigidity and the guided alignment of the large toe suggests a transition between tree climbing and upright walking. 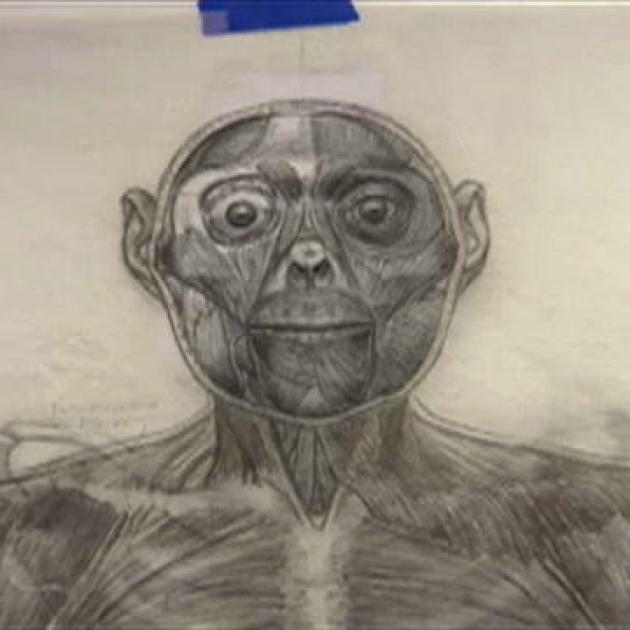 The following image shows some interpretative fleshing-out of Ardi's body based on skeletal, and other relevant, evidence. Whereas Lucy had feet much like ours Ardi's foot had a long, curved big toe that would help her grip tree limbs but the other four toes were stiffer and flat which would have been helpful for walking on two legs. 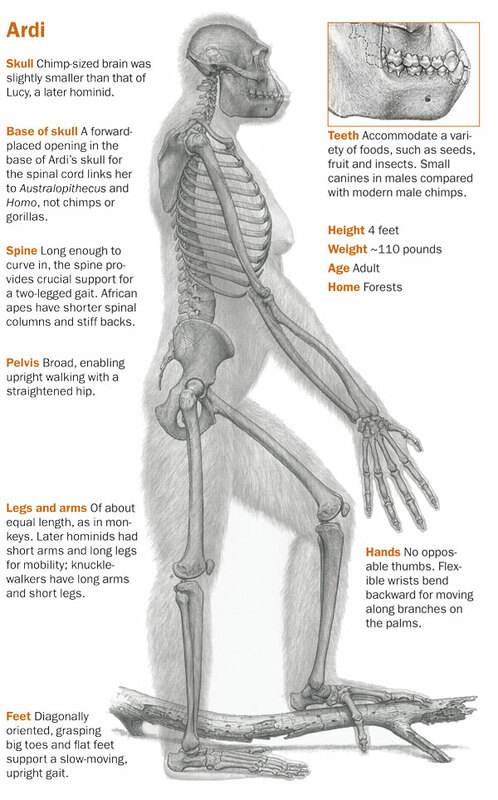 Ardi's pelvis fits like the foot, is something of a hybrid - the hip bones are low and curved and somewhat adapted to bi-pedalism, or walking upright on two legs, without obviously shambling like a chimp. 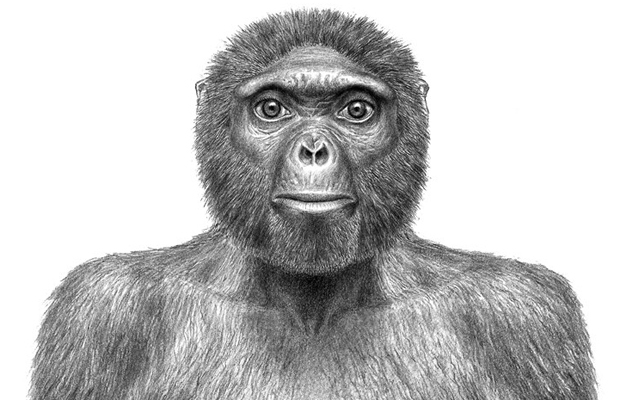 The Ardi fossil discovery undermines the previously prevailing idea in terms of human origins that we evolved from chimpanzees, our closest living genetic relative, and that our earliest ancestors would therefore resemble a chimp. The research team now says that our evolutionary paths branched from a yet more distant - last common ancestor - dating from more than 6 million years ago. This last common ancestor was probably somewhat hominid in form and it was only after this branching that chimps and gorillas adapted the large upper bodies, stiff wrists and short torsos that help them swing through the trees. "People often think we evolved from apes, but no, apes in many ways evolved from us, it has been a popular idea to think humans are modified chimpanzees. From studying Ardipithecus ramidus, or 'Ardi,' we learn that we cannot understand or model human evolution from chimps and gorillas." Ardi is "turning evolution on its head" ... "we're going to have to rewrite the textbooks on human origins." "The common ancestor looked like Ardi. It's the chimp and gorilla that have evolved enormously, not hominids. Hominids have concentrated their evolution in two things -- upright walking and brain. Everything else is pretty primitive." "This find is far more important than Lucy. It shows that the last common ancestor with chimps didn�t look like a chimp, or a human, or some funny thing in between." The following image is a graphically expressed intepretation of Ardi's head and face based on available evidences. The following image, again attributed to Scientific paleoartist J.H. Matternes, featured on a Discovery channel program, Discovering Ardi: Bringing Ardi Back, and may show something about the background procedures involved in such a process of interpretation. In terms of Human origins it may be that Ardi was tending towards our branch of life, and was physically and behaviourally committed to spending much time walking upright on the ground. "Ardi tells us twice as much as Lucy did. We have hands and feet, a more complete environment, a more complete skeleton, it's older, it's more primitive, it shows us the process of transformation from common ancestor to hominid,"
"She has opposable great toes and she has a pelvis that allows her to negotiate tree branches rather well, so half of her life is spent in the trees; she would have nested in trees and occasionally fed in trees, but when she was on the ground she walked upright pretty close to how you and I walk. " The researchers suggest that "whatever made Ardipethicus ramidus come down from the trees had to be phenomenally powerful" in terms of survival benefits that followed from habitual bipedalism. Such survival benefits could come in terms of safety, the winning of foods for nutrition or, perhaps, greater success in courtships and breeding. It seems that ground living bipedalism would not have been dramatically safer in an environment where predators probably took a regular toll of victims so it follows that strong long-term survival advantages must have flowed in terms of nutrition or breeding success. Ardipethicus ramidus lived all of 4.4 million years ago - this is way, way, back in time. In terms of human evolution Ardipithecus' body structure shows very limited objective or undisputable transition toward many uniquely human features. Humans have unique feet, ankles and musculature, unique hip structure, unique teeth and crania, totally unique cognitive abilities, a distinct "gut structure," a full commitment to upright walking, unique vocal apparatus, a "precipitous reduction of olfactory receptors", and an "unusually energy-thirsty brain." Does Darwinian Evolution offer much in terms of explaining Human Nature? Could such Materialistic, Spiritual and Social-group related tendencies as those just mentioned all tend to be aspects of a "basically Tripartite" Human Nature? "bundles of relations and knots of roots" give rise to the "World" of Human Societies!! !